Prepay and receive 15 months for the price of 12. Monthly mailings of class materials to your door. on a country by country basis. Contact Anne for specific information. Or check out the International Download option. Once in a lifetime a quilt like this comes along. When a photo of this quilt was shared with my small quilting group here on Lopez Island the email chatter exploded! Everyone was stunned / amazed and in awe of the workmanship and crazy beauty of this quilt. I was asked to create a pattern and teach the making of it to a few friends. 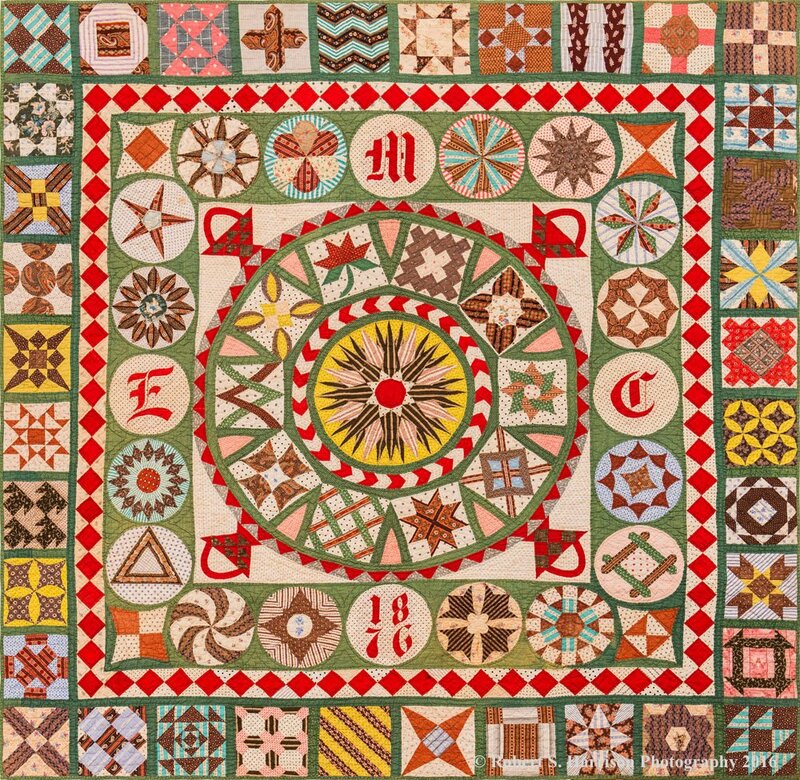 Thus The 1876 Centennial Quilt Project was born. I began work in earnest in July 2015 and finished my quilt top and the first draft of the pattern in February 2017. I finished hand quilting in November 2017. Step by step, block by block you will recreate The 1876 Centennial Quilt 90" x 90". You determine the colors and style of fabric - Reproduction to Modern - it's up to you. Hone your piecing skills as you learn different techniques, tips, and tricks while working your way through 81 individual blocks and borders; some easy, most not. The end result is well worth the effort. No matter your skill set at the beginning of this project, at the end you will be a more confident and skillful quilt maker - guaranteed! this is for you. I will give you as much support as possible, with the goal that everyone who starts will finish. I look forward to taking this amazing quilt making journey with you. Please contact me, Anne Dawson with your questions. If you haven't already done so please watch this short introductory video. Materials included: Each month you will receive 7-8 patterns, instructions and specialty template papers as needed. Questions answered and support given. A 15 month commitment is required.